Domestic Orders Over $100 Ship Free! Linda began making cheese close to two decades ago and has been doing so ever since. Initially she followed recipes and did not really understand the process. This was a fabulous place to start. As she continued to eat her favorite farmer cheese, she became curious about creating other types of cheese that could be enjoyed and were nourishing. So whether you understand the process or not you can follow simple recipes and make delicious cheese. The most important thing to understand is that the cheese you make is only as good as the milk that you start with!!! Historically all cheese was made with farm fresh raw milk. There is a growing desire and movement that is incorporating farm fresh raw milk back into the American diet. Many people are coming to understand that pasteurization destroys nutrients and creates a product that is not easily digested. Also remember that not all raw milk is the same. If you are milking your own animals-you know what the conditions of your milk are. If you are purchasing milk, become an informed consumer. Read about best farm practices and interview the farmer you are purchasing milk from. Visit and tour the farm. Make sure the farm is clean and that the animals are being let out to pasture. Be sure the farmers drink the milk themselves and that it is strained shortly after milking. As Linda started making cheese, she realized that it is impossible to make decent cheese from the milk you purchase in the store. If you are nervous about raw milk and still want to make cheese, the best luck you will have is with low heat pasteurized milk. Most milk is high heat or ultra-pasteurized, although some organic producers do low heat pasteurize. Just call the company and they should be happy to tell you what their practices are. Particularly high heat pasteurization destroys proteins and leaves very little to coagulate or curdle. When contemplating this the bigger question to ask about food which has been destroyed to this extent is “Is this healthful?”. Most cheese makers are adding ingredients to help pasteurize milk coagulate, when raw milk has all it needs to form a nice curd and a flavorful product. but many of the larger scale producers (even organic) are using this practice. If the cheese is not pasteurized it is required that it be aged for at least 60 days (theoretically the acid level would be high enough at this point to eliminate potentially harmful bacteria). Fresh cheese (not aged) that is made with raw milk cannot be purchased. In order to know what is in the cheese that Linda eats she has decided to make most of her own cheese and only on occasion selectively purchase cheese from small artisans cheese makers. So that said, she makes all of her cheese fresh as well as aged from farm fresh raw milk. And hope that is inspires others to craft cheese in their own kitchen!! ENJOY OUR VIDEO ON CULTURING MILK! The following is a recipe for the first cheese Linda ever made. It is a simple cheese that is easily crafted and quite yummy. It can be made with cow, goat, sheep or any other milk you have on hand. This is a simple cheese that is quickly crafted and delicious to eat!! I prefer to make this with goat milk, but it can easily be crafted with cow, sheep or any other farm fresh milk you have on hand. This recipe is adapted from one that was offered to me by herbalist Susun Weed. 1) Warm 1 gallon of milk to 80-90 degrees. 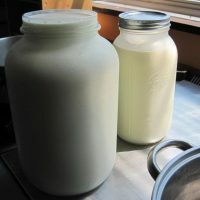 You can add fresh whey from your previous batch of cheese as a culture - to every one gallon of milk you would add 1 quart of whey: This is not necessary, but if you are using raw milk it will add flavor to your cheese. 2) Add 13 drops of rennet to each gallon of milk, plus a squirt for good luck. 3) Let stand until the entire mass is solid (the texture of tofu). This will take approximately 45 minutes to one hour. 4) Cut the mass all the way through in a grid pattern. 5) Slowly heat to 100 degrees (increase heat 2 degrees every 5 minutes). This will take approximately ½ hour. The curds will shrink noticeably as you stir. The whey will increase in quantity as the curds shrink. 6) Separate the curds and whey and place in a bowl. Slightly over-salting to taste because much of the salt will be lost while draining. 8) Add garlic and/or herbs (optional). 9) Pour the curds into a cheesecloth-lined colander that is over a bowl or bucket to catch the whey. 10) Knot one corner of the cloth around the other three corners and hand the bag of curds to drain for one hour. I often hang the bag above of my sink or with a wood spoon over a large pot or bucket. If you are making 5 gallons worth of cheese, you will hang your cheese for 12-24 hours and this will be sufficient pressing. 11) For 1-4 pounds of cheese: After one hour, pour the drained curds into a bowl, then break them up gently into walnut-sized pieces. 12) Place curds into a clean cheesecloth and place into a press. If you do not have a cheese press, you can place the cheese on a plate, tie a bandanna around the cheese, and place between two plates. Place a heavy object(s) such as clean bricks, containers of water, cast iron pot etc. on top and press for 12-24 hours. Eat and enjoy!! Place unused portion in the refrigerator for up to a week. Sign up for Herbal Musings & Updates!